In this issue of Jstar’s Chronicles, I take on the recently revealed specs of Microsoft’s upcoming Project Scorpio. In an almost sudden change of events, Digital Foundry and Eurogamer were able to announce the new specifications of Microsoft’s next video game home console, ‘Project Scorpio’. The title and price weren’t revealed, but we now know how powerful it’ll be. And boy, is it powerful. Yep; that’s pretty big. The memory, CPU, and especially GPU have all received big improvements. Project Scorpio will now run at around octa-core 2.3 GHz with its CPU. The GPU will now feature 40 compute units at 1172 MHz, compared to the Xbox One S at 12 at 914 MHz (Original was at 853). The RAM has gone from 8GB of DDR3 and 32MB of ESRAM to a whopping 12GB of GDDR5; for comparison, the PS4 Pro has 8GB of GDDR5 and 1GB of DDR3. The memory bandwidth might just be the most shocking to some people; the DDR3 speeds were at a slow 68GB/s, with the Xbox One S’ ESRAM coming in at 219GB/s. Meanwhile, the PS4 Pro has its RAM entirely at 218GB/s. Project Scorpio… has 326GB/s. Textures are going to load faster. The last big change (besides the “improved” hard drive) is the optical drive. This hasn’t changed compared to the Xbox One S, but it’s still tempting to look into as the PS4 Pro is stuck at 1080p Blu-ray discs. Project Scorpio (like the recent Xbox One S) has full support for 4K Ultra-HD Blu-ray discs, which is insane to think about. There’s also a bunch of other things that Microsoft brought up: this includes that the majority of 900p and all 1080p Xbox One games can easily run at native 4K. Games that were originally optimized will need to be looked into compared to others, of course, but it should overall offer a massive boost for almost all current Xbox One (S) games. There are still a few things we don’t entirely know about Microsoft’s Project Scorpio: This includes a full list of supported launch games, the price, and it’s UI. The first two are especially concerning, but the UI seems to have 4 GB available for the UI to render properly in 4K. The games seem to be developing nicely however, with the biggest surprise coming from Forza, Microsoft’s leading racing franchise for Xbox. Project Scorpio was shown off running a Forza tech demo, which was ported to Scorpio in 2 days. This means that no platform specific changes were implemented. 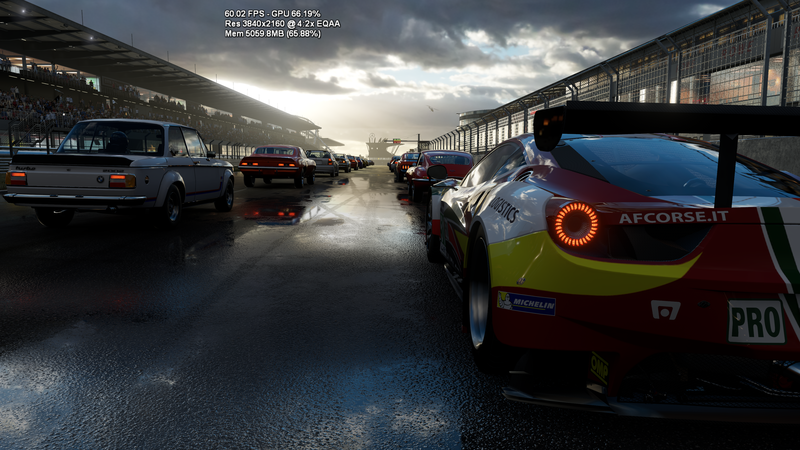 What happened was that at Xbox One quality, rendering at 4K and 60 FPS, it was only using about 66.19% of the GPU. When Ultra quality assets were used, it went up to the high 80’s. Keeping in mind that this port is un-optimized, so it could easily lower and allow even greater detail. Just look at the (~10 MB) screenshot here. Yeah, that’s pretty convincing. It’s only using about 2/3 of the available GDDR5 RAM and GPU in general at that point, with a lot of room to work with for optimization. As long as developers care for it, we could be looking at some sharp looking games. Or… we could be looking at gorgeous-looking 1080p games at 60 FPS instead. For potentially more people, this is what people will be interested in. I’m one of those people, at least for the time being. Yeah, it’s a pretty big boost over the current best (PS4 Pro), and a massive boost over the current Xbox One (S). This supports the fact that games at current quality may easily be able to boost their graphical potential (and resolution/frame rate) beyond what we expect. However, the last big thing to consider throughout all of this… is the final price. There was no confirmation of what to expect for Project Scorpio’s price, except that it aims to be “Premium”… which really doesn’t conclude a whole lot. My personal prediction is that it can be anywhere between $399 and $499. Anywhere in this range is understandable, with $499 being the original Xbox One price (even though it was widely disliked), while $399 could be to undercut the PS4 Pro at the same price with much-better performance. From the looks of it, however, Microsoft could take a loss at that price. These are only my assumptions, but I wouldn’t expect $399. If that was the case, this would be extremely tempting. I’m also not entirely concerned with the tentative name. After the Xbox One’s release, I feel like Microsoft learned a thing or two from themselves and Nintendo. It’d help if it had a cool name… let me know if any of you can think of one. 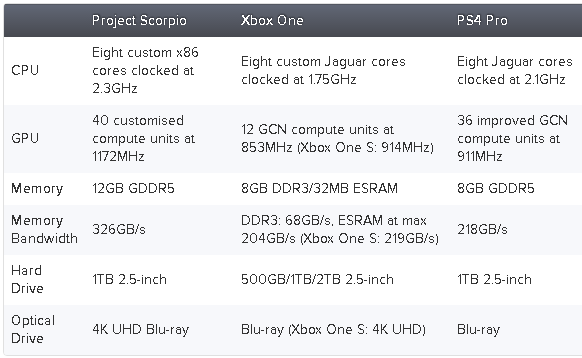 Overall, how do I feel about the new specifications for Microsoft’s Project Scorpio? Well… hyped, but not in a confirmed place. The specs are truly insane, and are quite good-looking, but the price and launch games will decide a majority of the final outcome. Game potential is looking good, but a higher price than the competition never looks good, no matter the conditions beside it. If it’s more expensive, people will complain and potentially not buy it. If it’s the same price, and again my assumption, it would most likely be at a loss, which isn’t always a good look for a company. In the long run, it’d be a better idea that way, and I’d be much more tempted to get it at that price. As an owner of a PS4 Pro, I will admit that it’s not perfect, and pretty much almost everything about it is the way I wanted it for Project Scorpio. If it’s the same price 1 year later, Sony may be in trouble, which is always good for everyone. I’d love me some competition. The recent Star Wars: Battlefront game by EA eventually got better over time, so here’s hoping that EA gets it right out of the gate. I also hope that Project Scorpio gets native support for it. Yooka-Laylee Will Support XBOX Play Anywhere! People who buy Playtonic Games’ Yooka-Laylee on Xbox One will also get it for Windows 10, and vice-versa. This is fantastic news and a great thing for people who want their game on more platforms for less of a price. “The Multiverse allows Besiegers to create multiplayer sessions of the game (Up to 8 Players) to build, battle and compete with their friends. Alongside this we’ve included a large set of tools, allowing players to not only create their own custom levels, game modes & objectives, but create them with their friends in real time. Furthermore, players can choose to play/simulate custom levels, while their friends are still working on them! Awesome news for people who at the moment love Besiege. Keep in mind that the game will go up by $2 once the update releases, but current owners will get access for free. Next week will feature yet another “My Take” on something in the gaming world, along with potential for a surprise or two. Until then, thanks for reading! Leadbetter, Richard. “Inside The Next Xbox: Project Scorpio Tech Revealed”. Eurogamer.net. N.p., 2017. Web. 9 Apr. 2017.